While Oliver Queen is fighting criminals in Star City during Arrow Season 4, his flashback self will be spending time in another metropolitan area for his next year in hell: Coast City. Known to comic book fans as the hometown of Silver Age Green Lantern Hal Jordan, this is a DC Comics locale that has been mentioned repeatedly during Arrow’s last three seasons but never visited… until now. Earlier today, executive producer Marc Guggenheim posted a link on Twitter that led to production art of the famous DC Comics city. The city’s slogan is an adaptation of the oath the Green Lanterns say when recharging their power rings, although it’s unclear whether this is just a playful Easter Egg or a hint of something bigger. In the Arrow Season 3 finale, Oliver left China on a ship heading for Coast City, and when the Season 4 flashbacks resume months later, he will be hanging out in the city to deal with his inner darkness. It’s unclear whether this year’s flashbacks will take place entirely in Coast City or elsewhere, but eventually Oliver will battle villains like Baron Reiter and Conklin, as well as be exposed to magic. The big question now is whether we’ll see a Green Lantern appear on the series, with or without a power ring. Although Hal Jordan was alluded to in The Flash episode “Rogue Air” as a test pilot who went missing, Guggenheim later said that it’s unlikely Hal will appear on either superhero show given the Green Lantern Corps movie that’s coming in 2020. Of course, that’s not to say a lesser-known Green Lantern isn’t a resident of Coast City in this universe, like Guy Gardner or Kyle Rayner. It’s also worth mentioning that Coast City is where Ferris Air, the airline company seen and mentioned many times on Arrow and The Flash, has its main headquarters in the comics. The company is overseen by Hal’s on-and-off girlfriend Carol Ferris, and we’ve wondered whether Oliver’s new love interest, played by Elysia Rotaru, is possibly the show’s version of Carol. Whatever the Arrow creative team has in store for Oliver and Coast City during Season 4, it’s good to see they’re having a little fun with the Green Lantern mythos. 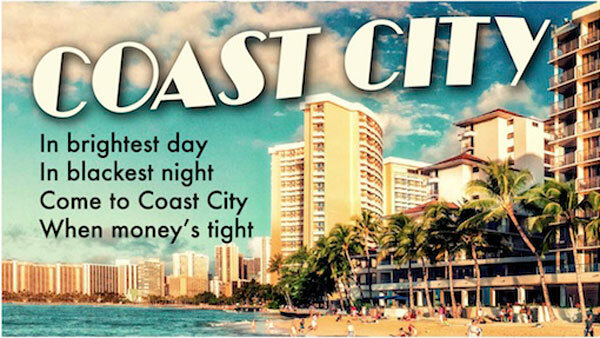 Coast City’s beach setting will also make for a refreshing change of scenery from the grittiness of Star City, and judging by the travel ad above, it’s the ideal vacation spot for people looking to get away without breaking the bank. Fans will see what Coast City has to offer when Arrow Season 4 premieres on Wednesday, October 7 at 8 p.m. ET on The CW.